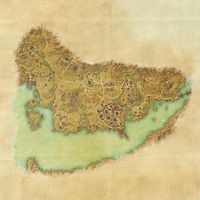 Situated at the head of the strategic Iliac Bay, Stormhaven is the geographic center of High Rock, and also the home of the great trading city of Wayrest, capital of the Daggerfall Covenant. Stormhaven is the south-central region of High Rock. 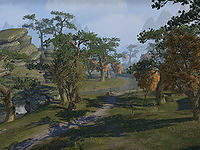 The city of Wayrest, the home of High King Emeric, is located here. Despite the signing of the Daggerfall Covenant with the Orcs and Redguards, and its acceptance by most Bretons, there is still an underlying resentment towards the Orcs from the Bretons of Wayrest. Stormhaven is a temperate region of sparse woodlands and farmland, with the weather changing spasmodically between clear skies and heavy rain. In the west, the region of Alcaire is governed by Duke Nathaniel from Alcaire Castle. The regional knightly order, the Knights of the Flame, are based at the nearby Firebrand Keep, which also serves as a milegate on the road to Wrothgar. A watchtower marks the start of the hillside trail to Glenumbra, while Newgate guards the southern end of the mountain pass to Rivenspire. The city of Wayrest dominates the central region of Menevia, a lowland area which is also home to dreugh spawning grounds. The Spirit Wardens of Pariah Abbey have been investigating the increased activity of the cult known as the Supernal Dreamers, while the Midnight Union have been expanding their operations in the region. The Gavaudon region in eastern Stormhaven is the location of the ancient statue known as the Weeping Giant, beyond which lies the bridge to Bangkorai. A Dangerous Dream: Find a Lion Guard captain who was kidnapped by Daedric cultists in Stormhaven. False Accusations: Ensure Koeglin Village remains safe from those who would do it harm. The Flame of Dissent: Stop the Knights of the Flame from attacking the Alik'r army at Alcaire Castle. Retaking Firebrand Keep: Put an end to the plan that threatens the Covenant. Sir Hughes' Fate: Assuage the evil omens plaguing Sir Hughes. Unanswered Questions: Seek the counsel of the Spirit Wardens in Menevia. Fire in the Fields: Help extinguish the fires in the fields at Pariah Abbey. Azura's Guardian: Look for the Spirit Wardens that went to investigate the Cave of Dreams. A Prison of Sleep: Make use of a soporific potion and enter a dreaming sleep. The Signet Ring: Help resolve the situation between Count Hosni at-Tura and his father. Evidence Against Adima: Help Lady Sirali at-Tura collect enough incriminating evidence to exonerate her son. Saving Hosni: Take another trip into the Dreamstride at the At-Tura Estate. General Godrun's Orders: Help the Murtag Clan reclaim Shinji's Scarp. Ending the Ogre Threat: Stop the Ironhand ogres from using a mountain cavern to attack Shinji's Scarp. Godrun's Dream: Rescue the general from the realm of nightmares. An Offering to Azura: Deliver a soldier's offering to the Spirit Wardens. Waiting for Word: Deliver a dispatch to Clan Murtag soldiers in Menevia. Can't Leave Without Her: Convince a terrified woman to leave a Daedra-infested farm. Captive Crewmembers: Rescue some shipwrecked sailors from a group of slavers. Divert and Deliver: Help free some sailors from a group of slavers. Do as I Say: Deliver a token to warn a bandit's younger brother. Legacy of the Three: Seal the spirits of three bandit lords away, forever. Lighthouse Attack Plans: Retrieve plans for an attack on the Koeglin Lighthouse. Lost Lions: Help rescue ensorcelled knights from the Bonesnap Ruins. A Family Affair: Help rescue a captive father. False Knights: Prevent common bandits from masquerading as knights. Repair Koeglin Lighthouse: Repair the lighthouse and prevent the slavers from causing more shipwrecks. Repairing the Cage: Restore the Ayleid bindings to contain a dangerous Daedra. Rozenn's Dream: Rescue a farmer's daughter from Daedric cultists. Scamp Invasion: Help stop a Daedric invasion. The Slavers: Help a worried mother find her missing son. The Slumbering Farmer: Rescue a farmer from a dark ritual. Abominations from Beyond: Rescue a group of locals held captive by the undead. Curse of Skulls: Lift the curse on a ruined tower. The Debt Collector's Debts: Help a debt collector settle his debt with his boss. Dreams to Nightmares: Make use of transliminal metaphysics to uncover the Supernal Dreamers' plot at Moonlit Maw. The Dreugh Threat: Render aid to a district under attack. A Gang of Thugs: Help the captain of the Wayrest Guard rid the city of a gang of bullies. The Gate to Quagmire: Expunge the Daedric spirit residing in Moonlit Maw. Injured Spirit Wardens: Locate and heal the Spirit Wardens caught in the abbey fire. A Means to an End: Return a totem to its rightful owner to appease their anger. One Last Game: Solve a riddle to find an inheritance. A Ransom for Miranda: Help collect a ransom to save a man's kidnapped wife. Rat in a Trap: Let a prisoner free in the midst of a dire situation. Revenge Against Rama: Track down Rama and make him pay for his crimes. The Sower Reaps: Discover who planted dreugh eggs in Dreughside. Stolen Ashes: Return a stolen urn to its rightful owner. They Dragged Him Away: Help find a distraught woman's husband. A Woman Wronged: Save a noblewoman from a group of bandits. Gift from a Suitor: Find out who trapped the countess. A Look in the Mirror: Look in on the countess and make sure she's okay. Next of Kin: Deliver the last words of a dead miner to his relatives. Ogre Teeth: Help a Murtag clan captain gather components for a war trophy. Old Adventurers: Help rescue a group of former adventurers. The Perfect Burial: Help plan the perfect funeral. Plowshares to Swords: Convince an old warrior to abandon the plantation. Word from the Dead: Bring the words of a dying man to his wife. No Second Chances: Return the Pellingare siblings to the grave. 5 items: When you take damage while you are under 35% Health, you knockdown all enemies within 4 meters of you for 2 seconds and heal for 81-7000 Health. This effect can occur once every 20 seconds. 3 items: Reduces the radius you can be detected while Sneaking by 2 meters. Reduces the cost of Sneak by 10-27%. 5 items: When you take melee damage, you deal 23-2000 Poison Damage to the attacker. This effect can occur once every 1 second. 5 items: When you take non-physical damage, you have a 10% chance to deal 50-4373 Shock damage all enemies within 5 meters of you every 2 seconds for 6 seconds. This effect can occur once every 6 seconds. 5 items: When using a fully-charged melee Heavy Attack on a taunted monster or any enemy who is stunned or immobilized, you will deal a bonus 140-12040 Physical Damage. This effect can occur once every 7 seconds. 5 items: Increases the duration of all Major buffs, Minor buffs, and damage shields you apply to yourself and allies by 40%.